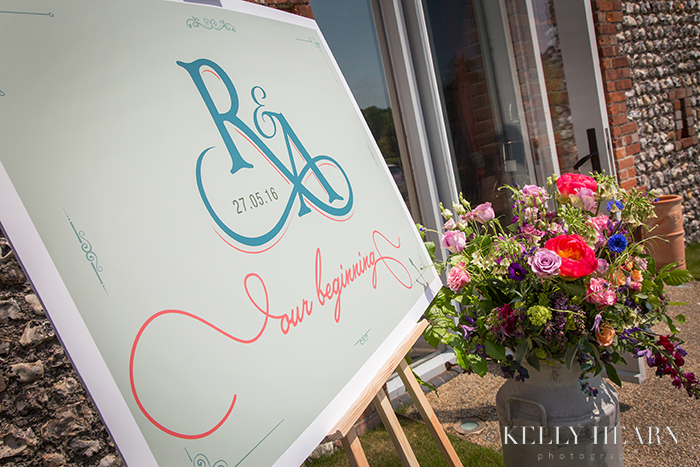 As a graphic designer it would have been almost impossible for creative groom Andrew Keen to not have come up with some fantastic branding to represent him and wife-to-be Rose on the most important day of their lives! If ever there's a reason deserving a good logo, it's two people, so in love that they are prepared to publicly celebrate this fact by getting hitched! I will talk more of Andrew's brilliant branding later in the blog, but I suppose what struck me the most about this couple's wedding day was that they had understood its significance, not just to them but to their valued guests who were thrilled to share the day with them. This was an event to bring together those young and old, to uphold the seriousness of ceremony, to shed tears of happiness and emotion, to enjoy the sharing of delicious food, to sense the nervousness of speeches delivered, to giggle with laughter at histories told, to feel joy in the music and abandonment in dancing. It was to be surrounded by bright colour in the celebration of two diverse personalities combining, who's value of detail through little thoughtful touches would offer so much meaning to many. This event required creativity, and Rose and Andrew clearly had this awareness - not missing a trick, designing and creating all the elements to provide that seamless and beautiful backdrop by which to celebrate their marriage.